Fri., Dec. 16, 2016, 3:57 a.m.
Sunday, Dec. 18: Gonzaga Bulldogs at Tennessee Volunteers, 1 p.m.
Ken Bone wanted to keep a foothold in coaching and still be able watch youngest daughter Chelsea’s senior year of volleyball at Sentinel High in Missoula. 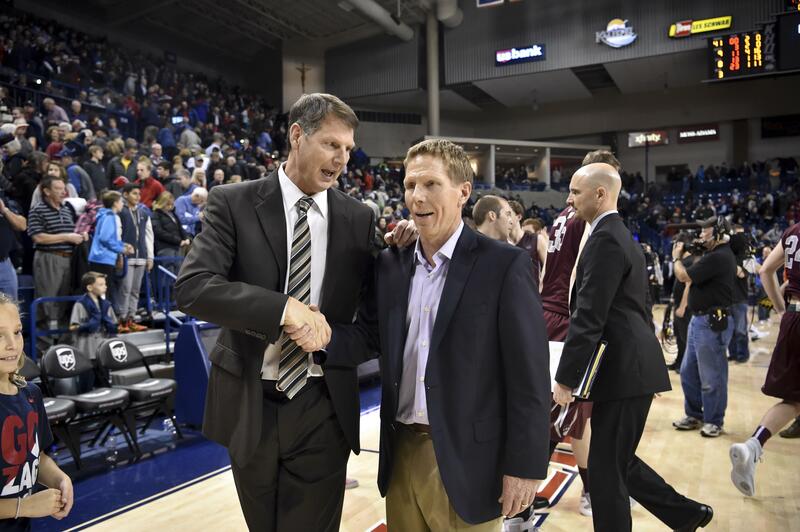 Mark Few wanted another set of veteran coaching eyes on his basketball team. Bone, who game-planned against Gonzaga for more than a decade while coaching at Washington, Portland State, Washington State and Montana, is now a special assistant to Few. Bone breaks down video, jots down notes, watches practice, jots down notes, scouts GU opponents, jots down notes, self-scouts GU and jots down notes. Earlier this week he handed Few a sheet of paper with practice observations. So far, so good. Chelsea’s team went undefeated and won a Montana state championship. Dad had an excused absence from the Gonzaga-Utah Valley game to watch Sentinel capture the title. No. 8 Gonzaga is unbeaten as it prepares to face Tennessee in Nashville, Tennessee, on Sunday. Gonzaga gets something in return. “Those guys” are displaced coaches that have filled the same role at GU in recent years. Wojcik had been fired at College of Charleston, George Pfeifer’s contract wasn’t renewed at Montana State-Billings and Eastern Washington had dismissed Kirk Earlywine. Bone spent the last two seasons assisting at Montana. He compiled an 80-86 record in a five-year run as WSU’s head coach that ended in 2014. His next move was almost geographically predetermined. Bone had coached at Olympic Junior College in Bremerton, Seattle Pacific and Washington. He lived in Vancouver while steering Portland State to two NCAA tournaments before taking over at WSU. “I started in Seattle and made a big loop around the state. Maybe I’ll end up at Central Washington or Wenatchee Valley,” Bone cracked. One of the first coaching jobs Bone pursued was at Almira/Coulee-Hartline, known then as Coulee-Hartline. He didn’t get it. Bob Bakamus, father of Zags walk-on guard Rem Bakamus, landed the coaching job and “he reminds of it me every time I see him,” Bone said. Bone and Few have known each other since Bone’s promotion to head coach at Seattle Pacific in 1990, roughly at the time Few arrived at Gonzaga as a graduate assistant. Bone studied Gonzaga’s program at his last three stops as an opposing coach. His perceptions then are similar to his ones now that he’s inside the McCarthey Athletic Center. It starts with strong support from the community and school administration. “You have a coaching staff that is experienced and they work really well together. It’s great coaching chemistry,” said Bone, who stays with a longtime buddy in Spokane when he’s not at the family home in Missoula. “It’s good team chemistry, good coach-player relationships. It all works together. How does this team stack up against some of the best ones Bone coached against? Bone pitches practice suggestions and adds “my two cents” to scouting reports put together by assistants Tommy Lloyd, Donny Daniels and Brian Michaelson. Meanwhile, Bone is learning a new system that broadens his coaching base. Bone’s stress level isn’t nearly as high as when he was a head coach, but the objective remains the same: Help put the team in the best possible position to succeed. Published: Dec. 16, 2016, 3:57 a.m.